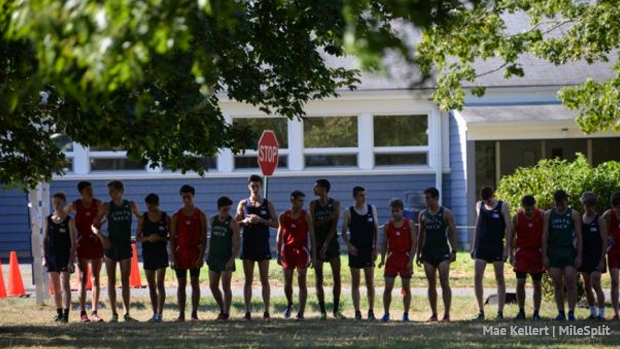 Photo from a 2016 tri-meet with Colts Neck and Manalapan. NJ #1 and US #15 Christian Brothers Academy opened its season on Friday by doing something it's done in every one of its dual/tri-meets since 1974. It won. With a 15-50 victory over Middletown South and a 19-44 win over Freehold Boro at CBA in Lincroft on Friday, the Colts extended its remarkable national dual meet winning streak to 359 in row!!! CBA, led by sophomore Sean Elliott's first career victory in 15:45.5, grabbed nine of the first 10 places to secure the two victories and keep the streak alive. Soph. Ben Santos was third in 15:56.1. Elliott edged Joe Locurcio of Freehold Boro, second in 15:46.7, and then CBA took the next seven places. CBA, which began its streak with a 15-50 victory over Marist on Sept. 19, 1974, hasn't lost a dual meet since Oct. 20, 1973 when CBA lost to Raritan, 15-49. Raritan was led by current Shore Regional coach Mel Ullmeyer. CBA, which won the Meet of Champions and placed seventh at the Nike Nationals last year, will put its top runners on the line for the first time this season at the Bowdoin Park Invit. on Sept. 22 in Wappingers Falls, N.Y.
Oct. 20, 1973 - CBA lost to Raritan, which was led by current Shore Regional coach Mel Ullmeyer, 15-49. It hasn't lost since. Sept. 19, 1974 - CBA's streak begins with a 15-50 victory over Marist. Oct. 20, 1981 - CBA wins thrilling sixth-runner tiebreaker over St. John Vianney (coached by current Colts Neck coach Jim Schlentz) to extend the streak to 94. Sept. 28, 2004 - CBA defeats Marlboro, 20-43, to tie Blackstone-Millville of Massachusetts for the national record for consecutive dual meet wins with 265. Sept. 30, 2004 - CBA scores a 15-50 win over Middletown North to break the national record with its 266th victory in a row. Blackstone-Millville set the record in 1992. Oct. 3, 2006 - CBA overcomes a 1-2 finish by Colts Neck (featuring All-American Craig Forys) to win its 281st in a row, 25-36. December of 2015: CBA coach Tom Heath retires from coaching after a 45 year career. Sept. 13, 2016, CBA, under new head coach Sean McCafferty, edged Colts Neck, 27-32, and defeated Manalapan 15-50 while averaging a course record 14:50.6 in Lincroft to extend its national record to 345 in a row. Oct. 13, 2016 - CBA concludes its season with a 23-34 victory over Howell at the Manasquan Reservior to raise its winning streak to 350 straight. Sept. 7, 2018 - CBA opens season with a 15-50 win over Middletown South and a 19-44 victory over Freehold Boro to extend the streak to 359 in a row.